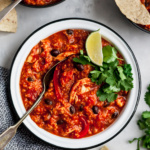 Slow Cooker Chicken Tikka Masala is a lightened up comforting Indian dish made with tomato sauce, chicken breast, coconut milk and various flavorful, bold spices. 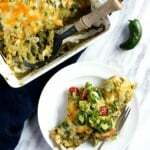 Serve with brown rice or naan for a full meal! Oh hi, it’s me! I’ve come back alive after cookie week recipes from last week. Did you guys happen to make any over the weekend? I’d love to hear! This post is in partnership with Mutti Tomatoes. 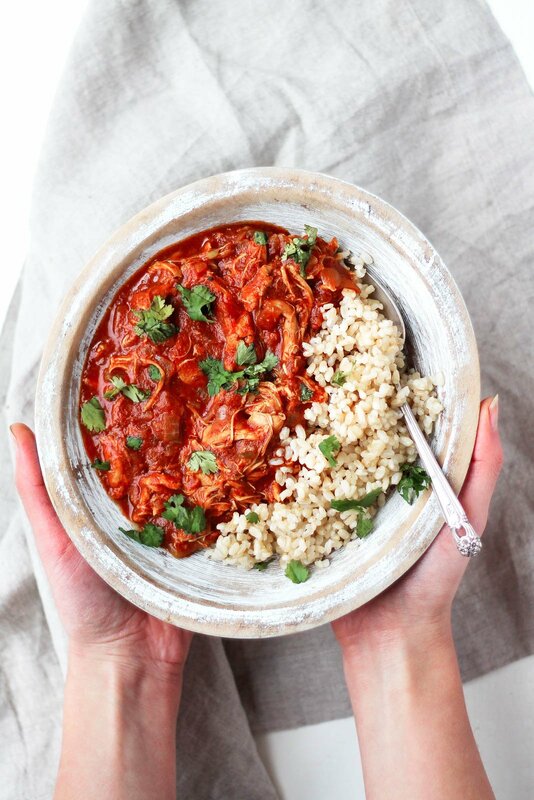 Since I’ve been posting a lot of treats lately, I thought we’d slow it down with this beautiful slow cooker chicken tikka masala. If you’ve never had tikka masala before you’re in for a delightful surprise. And if you have, then you know how lip-smacking good this dish can be! 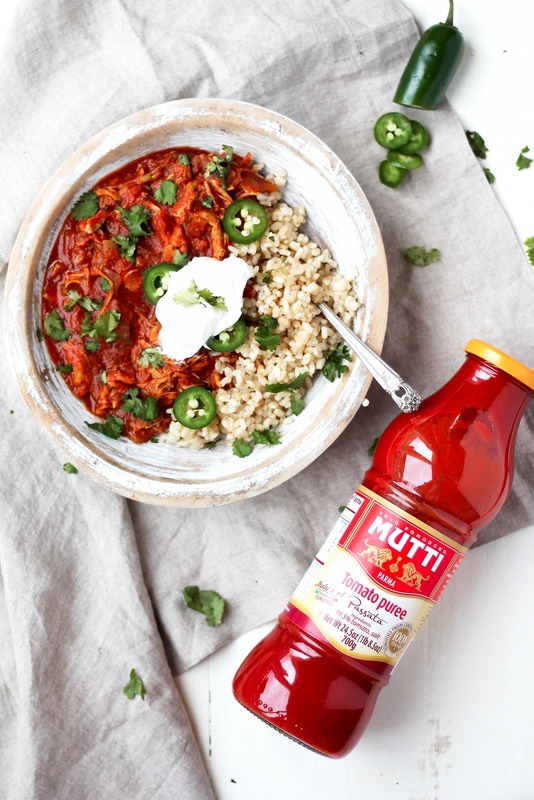 Today’s recipe is in partnership with Mutti tomatoes, Italy’s #1 canned tomato company that produces absolutely flavorful sauces, purees, and pastes. The first time I tried Mutti’s tomato puree (or as they call it Passata), I was shocked with delight. The tomato puree was silky smooth, sweet and didn’t have any tin-like flavor you get with other canned tomato sauces. The color of the tomato puree was bold and one of the freshest I’ve ever tried. I knew it was the perfect opportunity for me to create a rich and gorgeous chicken tikka masala. Tikka Masala is a popular Indian dish that’s typically made with heavy cream and butter. 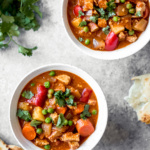 I’ve lightened up this version so that it’s just as tasty, but lighter in calories, so you can save room for pita bread or naan just for soaking up the creamy coconut milk tomato sauce. It can be spicy: so if you are sensitive to spice you can leave out the cayenne pepper. This recipe contains a variety of spices: Garam masala can sometimes be difficult to find, so head to a local spice shop! Whole Foods also carries it. Please do not omit from the recipe, it is crucial for flavor! Best served with glorious bread: This recipe is absolutely to die for when served with a pita bread or naan for soaking up the sauce. 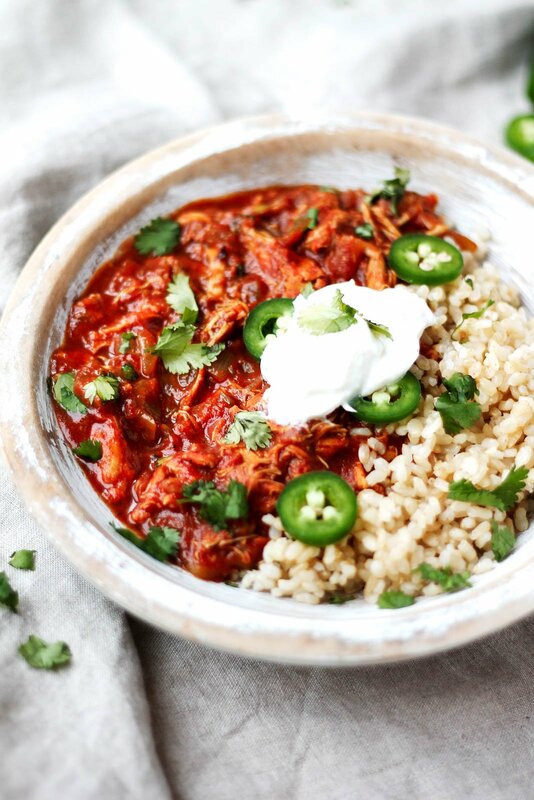 This incredible meal needs to happen in your slow cooker ASAP. It’s easy to make, bold and something different to try. A little spicy, a little sweet and hella delicious. Hope you get a chance to try it out. xo! Heat olive oil in a large skillet over medium heat. Add in onion, jalapeno, garlic, and ginger; saute for about 5 minutes or until onions are slightly golden and translucent. Transfer to a large slow cooker. Add in tomato puree, lemon juice, garam masala, paprika, cayenne pepper, turmeric, and curry powder; stirring to combine. Add chicken breasts and spoon sauce over the chicken to make sure they are covered. Cover and cook on low for 6-7 hours or on high for 2-3 hours. Once cooked, remove chicken with a slotted spoon and transfer to a cutting board. Shred the chicken with two forks, then transfer back to the slow cooker. Stir in coconut milk and allow to cook on high UNCOVERED for 15-20 more minutes to help thicken the sauce. Taste and adjust seasonings as necessary, including adding more salt, if desired. Serve with brown rice, pita bread/naan or enjoy as is. Garnish with plain greek yogurt and chopped cilantro. This post is in partnership with Mutti. The opinions and text are all mine. Thanks for continuing to support AK and the brands that help make this site possible! Be sure to follow Mutti on Facebook, Twitter, Instagram and YouTube. 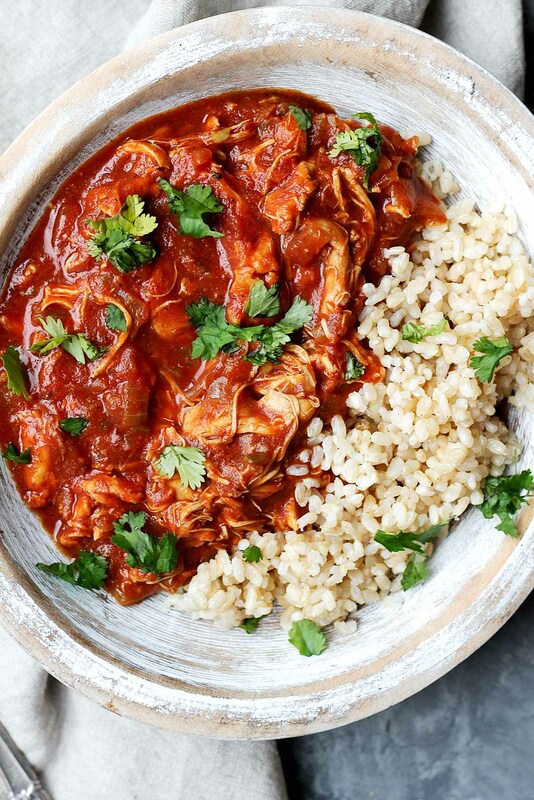 56 Responses to "Healthy Slow Cooker Chicken Tikka Masala"
This looks awesome Monique!! I’ve cheated and make tikka masala with a jarred sauce but this looks pretty simple and I love that it’s made in the slow cooker! Indian food is the BESTTT. Mmm yum! Indian food is the best! 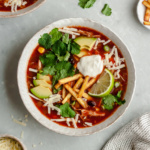 Will definitely be making this soon, thanks for the recipe! i love chicken tikka masala, but with all the cream and butter i usually feel like waddling to the nearest couch and doing nothing for the rest of the day. 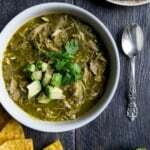 this lightened version sounds so delicious, especially with the coconut milk! I can’t wait to try this! Where does one find the Mutti tomato products? Can it be substituted with other tomato products if I can’t find it at a store near me? That’s a great question. I found mine at a specialty store! I have only tested this recipe with Mutti tomato puree sauce. Hi Sarah, in the NY area you can try: Whole Foods, Fairway markets, Gourmet garage, King, Balducci’s, West Side Market, North Shore Farms, EATALY stores. Also available online on Fresh Direct and Amazon. In the Chicago area you can find it in the folowing stores: Jewel, Mariano’s, Pete’s, Caputo’s, Tony’s, Valli, Strack n Van Till, EATALY. I ordered Mutti tomatoes from Amazon.com. I agree that it made a lot of the sauce and that more chicken would be better. 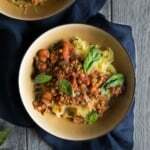 Looks like such a gorgeous meal for the winter months! So comforting, and it being healthy just makes it all the better! Looks yummy! Trying to see if I can make with ingredients already in my pantry though. Can I sub tomatoe sauce or tomatoe paste (with water of course) for the purée? Or could I blend up a can of diced tomatoes? Thanks in advance. Would love to make tomorrow ? Hi Elizabeth! I wouldn’t recommend using anything else other than tomato puree/sauce! Thanks for getting back to me. I will wait to make it until I head to the grocery store then! I made this last night and it came out delicious with tomato paste. I used Trader Joe’s organic tomato paste and diluted it with water. For every 3 tablespoons of paste, I would recommend around 3/4 – 1 cup of water. It came out beautifully especially when you add in the coconut milk- it creates a creamy texture. Nice photos. 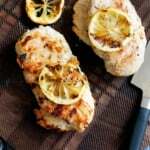 I love this dish because I like chicken a lot.Thanks to this post i have one more amazing way of cooking chicken, Thanks a lot! Just a quick note, if you are a spice wimp like me, the amount of heat will vary greatly depending on the garam masala spice mixture you purchase. I think we have found the Frontier brand to be the spiciest. I love Tikka Masala, but have definitely eaten some that left my mouth on FIRE! Ha! I always cheat and just make a curry from the jar, but I definitely think I’m going to give this one a go! May not be spicy enough for my husband though as he loves Madras! I see that grated ginger is in the ingredient list but not in the directions when does it come into play ? When you add in the minced garlic and the rest of the spices. Love this easy version of one of my favorite Indian dishes! I didn’t think a different kind of tomato sauce would make much of a difference, but I’m so sad that my local grocery store doesn’t carry this because it’s just so much prettier than what they do carry. On my next Whole Foods run, I’ll have to stock up. I’m making this tonight in my swanky new Dutch oven and I’m so excited to see how it turns out. Just from the ingredient list, I’m thinking delicious. Same here, I wasn’t sure when to add the ginger, probably with the onions, garlic, jalepeno, but it was too late to add when I noticed it. This is really good. Followed the recipe exactly. Wish I could post a photo. Omg I made this a few weeks ago and it was amazing. Hi Norissa! I don’t own an Instant Pot, so I’m not certain how it would work. Sorry! The flavors are delicious! Thanks for the recipe! My 4 year old said this was the best chicken he has ever eaten. Everyone loved it! Such an easy recipe. This will be a staple in my house from now on! Question can I use frozen chicken.? Hi Ben! Yes, just thaw the chicken first. Enjoy! You never answered when to add the ginger. I am assuming you add with the other spices, I don’t think you saute it with garlic? Apologies for my delay – add the ginger with the onion, jalapeño, and garlic! Made this today used passata , and its a fabulous.